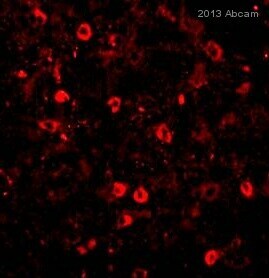 Rabbit polyclonal beta Amyloid 1-42 antibody. Validated in IHC, ICC and tested in Rat, Dog, Human. Cited in 37 publication(s). Independently reviewed in 11 review(s). This antibody is reactive with A Beta 42 and does not cross-react with A beta Amyloid 1-40, full-length APP, sAPP beta or sAPP alpha. 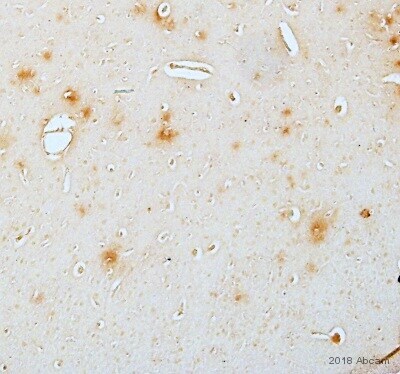 We have evaluated this antibody by IHC and have not specifically evaluated reactivity with oligomeric forms of beta amyloid. Synthetic peptide conjugated to KLH, corresponding to amino acids 33-42 of Human beta Amyloid 1-42. Do not store antibody diluted below 0.5 mg/ml. We have received positive and negative feedback from customers for the WB application and Mouse as a tested species. WB is not batch-tested application and Mouse is not a batch-tested species for this antibody and we are not able to cover WB and mouse under our Abpromise guarantee. Our Abpromise guarantee covers the use of ab10148 in the following tested applications. IHC-P Use at an assay dependent concentration. Retrieve antigens with 70% Formic acid for 10-30 minutes at room temperature before commencing with IHC staining protocol. 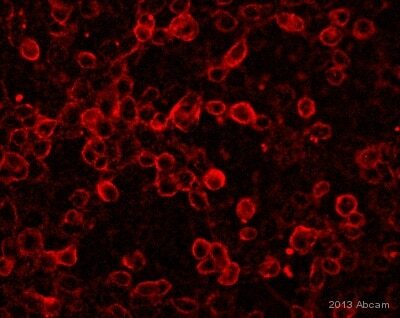 ab10148 staining beta Amyloid 1-42 in Rat astrocyte cells by ICC/IF (Immunocytochemistry/immunofluorescence). Cells were fixed with paraformaldehyde, permeabilized with methanol and blocked with 5% serum for 1 hour at 4°C. Samples were incubated with primary antibody (1/100) for 18 hours at 37°C. An Alexa Fluor® 594-conjugated Goat anti-rabbit IgG polyclonal (1/200) was used as the secondary antibody. ab10148 at a 1/50 dilution staining mouse AD brain tissue sections by Immunohistochemistry (Formalin-fixed paraffin-embedded sections). Following heat mediated antigen retrieval, the antibody was incubated with the tissue for 24 hours. 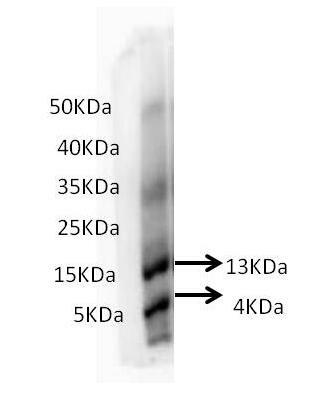 Bound antibody was detected using a biotinylated Goat anti-Rabbit antibody. This image is courtesy of an Abreview submitted on 15 March 2006.
ab10148 staining mouse skeletal muscle tissue sections by IHC-Fr. Sections were acetone fixed and blocked in 5% BSA for 30 minutes at RT prior to incubating with ab10148, diluted 1/100, for 12 hours at 4°C. A FITC conjugated goat anti-rabbit antibody, diluted 1/200, was used as the secondary. Publishing research using ab10148? Please let us know so that we can cite the reference in this datasheet. I am working on Alzheimer's Disease in non transgenic mice (LPS induced). I tried before an antibody (from *competitor name* company in Germany) for WB with brain homogenates in PBS and protease inhibitor cocktail but unfortunately I obtained numerous non-specific bands and no 4kDa band. I wanted to buy your primary antibody ab10148 for my work. Will this antibody be suitable for the detection of the 4kDa band in the brain homogenate prepared as mentioned earlier? If there is any specific protocol that you would recommend I would appreciate it. Also what would be the suitable HRP or AP secondary antibody? I am happy to confirm that ab10148 (Anti-beta Amyloid 1-42 antibody) is tested and guaranteed to work in WB with mouse and human samples. Please check the pore size of the membrane that is used and make sure it is suitable for small proteins. https://www.abcam.com/index.html?datasheet=97061 (or use the following: https://www.abcam.com/index.html?datasheet=97061). kit for his work. Please suggest. This is confusing. ab113316 is a kit not antibody, customer would not be requiring a DAB kit for this. For ab101854, ab80436 will be a good product. method and DAB-ABC (ab64264) detection method. The kits ab80436 and ab64264, both will be OK to use with ab10148 only because it is rabbit antibody, you can select any one of them. Please note that these kits cannot be used with ab75714 because it is a chicken polyclonal antibody - you would require a anti chicken HRP conjugated antibody. There are two possibilities one you change ab75714 with mouse or rabbit as host, second buy the HRP conjugated anti rabbit and anti chicken secondary antibodies including DAB reagents.